Police in Poland in hunt of four Brits men who terrorized Krakow city in lime green mankinis. Police in Southern Poland reportedly in hunts for four tourists suspected to be from England after the authorities found them roaming around the Krakow city wearing nothing but lime green mankinis. The Polish found the group of English speaking pals on CCTV footage last Friday whilst they strolled around the Renaissance Market Square before going for a ride on a horse-drawn carriage. Several pictures of the four men in mankinis were also submitted to the police by a local member of the public who happens to be a photographer. Four men in Krakow Poland wearing nothing but a lime green mankinis. Authorities claim the reason they are looking for the men is for their disobedience to the laws of public decency. Although it's not confirmed yet if the boys are for real of British nationality, they're however assumed to be after one of them was seen with the flag of England tattooed on his arm, as indicated by the footage proof. If caught, the men could be convicted or face a fine of 5000 zloty (£1,000) each and also face up to 30 days in prison. Sebastian Glen, Krakow province police spokesman says such events have previously occurred too, especially caused by English people who often visit the historical city for parties that create disturbances after getting drunk. In his words, Glen said: "At the moment no one has been accused – we are still looking. There was a witness who says… they were speaking English. ‘They could be Australian or from other countries in Europe who use English. So we don’t know yet if they were British. It will not be easy to locate them. If they have already returned to their country it could be difficult." Tourists in mankinis strolling around the Krakow city. The police spokesperson further continued: "Many of them come for the weekend and sometimes we have incidents connected to alcohol, like being too loud or fighting, but to be almost naked in a public place? That’s not common at all. I remember a few years ago we had to find some Englishmen who ran naked through the market square." Mr. Glen then added that such incidents happened less in comparison to the tourists' total number who visited the city each year in records. 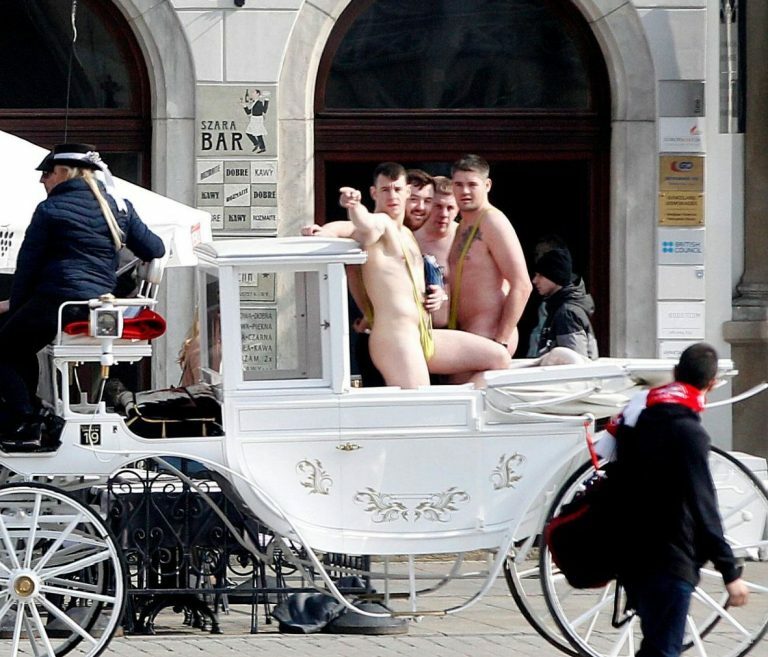 Sebastian said: "Many British people come here for bachelor parties and they wear costumes for fun but it’s very rare that they wear no clothes at all, so that’s why it was so shocking for people to see four men on a carriage in the middle of the day almost naked." Popular among pranksters and for stag parties, mankinis became famous after Borat, a fictional Kazakh character portraited by comedian Sacha Baron Cohen wore them. In other news: This is Not a Drill - It Turns Out Heinz’s Creme Egg Mayonnaise Is Real! When police arrested six Czech tourists in Kazakhstan for wearing mankinis, Cohen offered to pay their fines of £45, but only if they submitted the proofs that it was them.